Continued stock level monitoring by analysts show that stock levels of the iPhone 7 family are improving even under heavy demand —which could be a good sign for Apple's financial results. 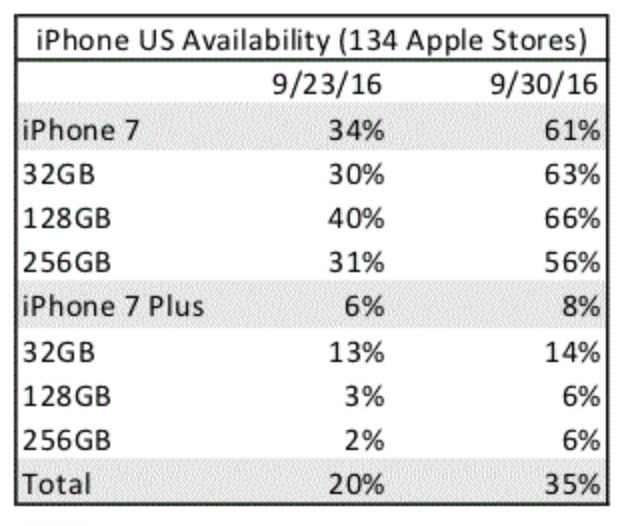 Continued stock polling by financial analyst firm Piper Jaffray provided to AppleInsider shows that 35 percent of the checked SKUs available for in-store pickup with the majority being iPhone 7 versus the iPhone 7 Plus. Analyst Gene Munster notes that the iPhone 7 will ultimately account for about 40 percent of total iPhone 7 units had 61 percent SKU availability, compared to 8 percent available for the iPhone 7 Plus. 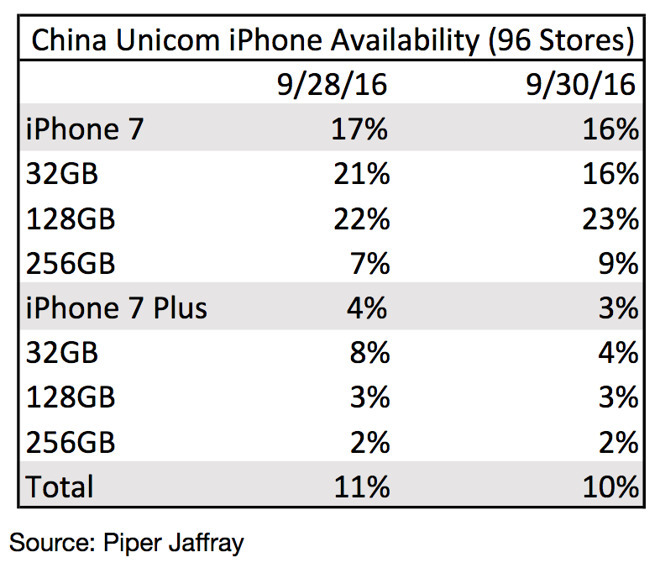 Stock at China Unicom is much more heavily constrained than in the U.S. Only 16 percent of the iPhone 7 SKUs are available, and 3 percent of the iPhone 7 Plus, with a decreasing trend. The firm believes the stock check reports to be a positive sign signifying high demand of the product, and has increased what it expects to see for Apple's next financial report from $46.5 billion in revenue to $47.5 billion. Should Apple hit $47.5 billion, it would fall short of 2015's fiscal fourth quarter by about $4 billion, but eclipse 2014 by more than $5 billion. 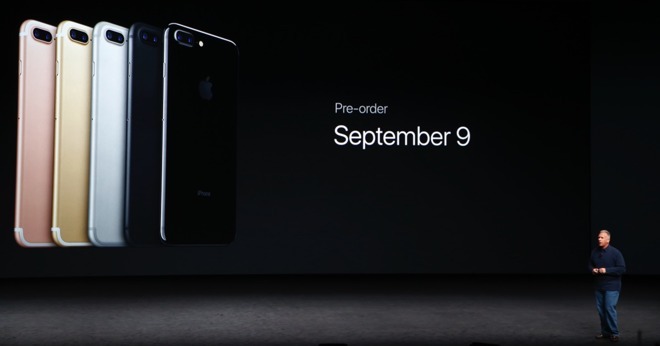 At the end of September, stock surveys showed that 20 percent of iPhone 7 SKUs were in stock overall, with 34 percent of the iPhone 7, and 6 percent of the iPhone 7 Plus models available for purchase. Piper Jaffray's continued positive interpretation of sales data is echoed by T-Mobile's CEO and an assortment of South Korean analysts claim record sales of the Apple iPhone 7 family. Based on supply chain data, the South Korean analysts expect 100 million sales of the new iPhone models before the end of the 2016 calendar year. According to research by KGI analyst Ming-Chi Kuo, the research firm has escalated its sales estimates from 65 million to between 70 million and 75 million, mostly because of the recall of the Samsung Galaxy Note 7 and the dual-camera feature in the iPhone 7 Plus.